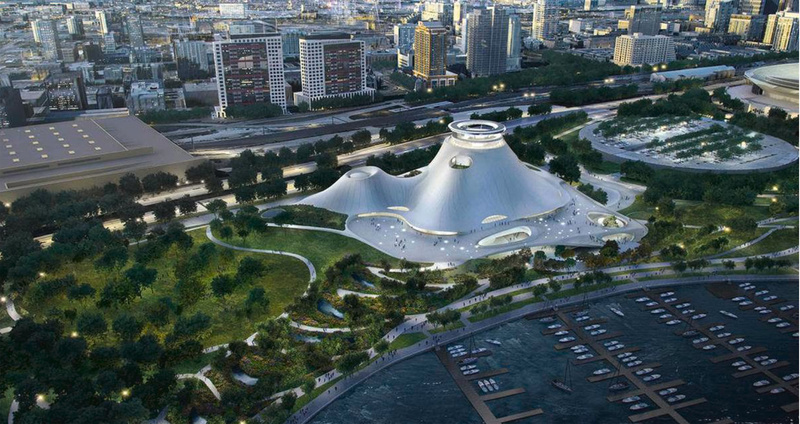 It seems George Lucas fans have a win in Chicago, as the city has just approved zoning for the mountainous Lucas Museum of Narrative Art. Designed by MAD, the sloping building reaches two volcano-like peaks, sitting just a stone’s throw from the Shedd Aquarium and Field Museum. The museum proposal has been battling for approval after receiving mixed reactions, particularly from some local environmentalists who felt the museum would take over public land. The addition of the new museum along Chicago’s Museum Campus Park will be constructed on land that some locals feel will deter from the public lakefront landscape. After much consideration and debate by the Chicago City Council, the plan was finally approved for zoning, with the promise from project planners that the museum will include more parking and tailgating space for Chicago Bears fans and celebrators. In reaction to the environmentalist opposition of the original plan, MAD has adjusted the museum’s plans. The sprawling structure was stream-lined, adding more public green space to the footprint. The general design has also been adjusted to be more harmonious with the landscape. In addition to parking spaces, the Lucas Museum of Narrative Art will also bring more landscaped parkland to the area for both museum visitors and the public to enjoy. The museum’s president Don Bacigalupi has stated that along with Chicago’s 57th museum, the project will bring 200,000 square feet of green space along Lake Michigan.